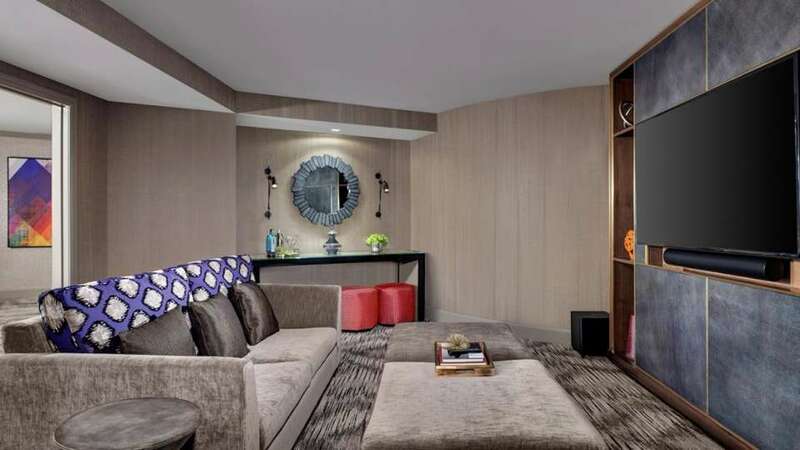 Have a look at the photos of the shooters room, they are not photos but renders. You can tell the difference. For those of us that are uneducated, what is the difference? A render is a computer generated picture, some are good enough that you wouldn’t easily be able to tell the difference. Just for reference here are a couple of room scenes done by amateurs using cheap render software. Those are so good a lot of people would never know they are computer generated images and not real photos. A render software package allows you to place objects and people in a virtual 3d environment and then place background items (trees, walls etc) and once you have set up the light sources etc the computer does all the calculations to figure out shadows etc and create the “picture”. Some movies do this and then they make a tiny change , render again and make another frame. 21 frames makes a second of film, but most movies haven’t gone to hyper realistic renders yet as it takes a lot of computer power for a single frame. So it’s still used more for stills. 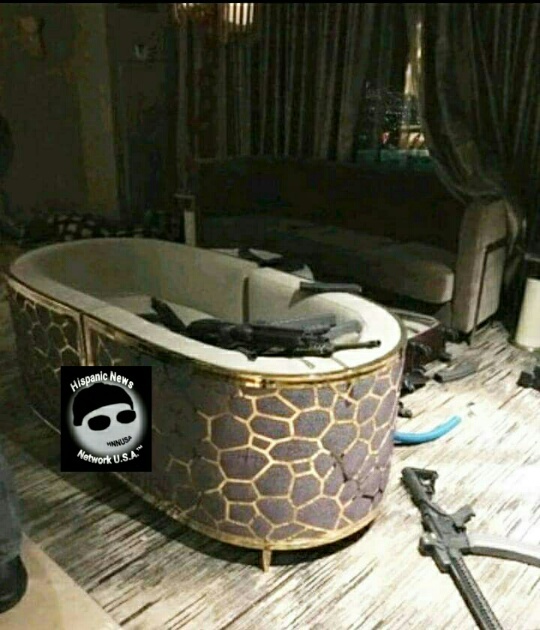 Here are a couple of the pics that have been released of the shooters room. Look at the carpet, it’s has no depth. It looks like a flat surface. When you generate a render you have thousands of things you can effect. One of these is called bump map, it’s where you tell the computer making the render how to give an object depth. For a carpet there should be different heights of fibers and the fibers should be individual fibers, with lower areas between them. Also look at the reflections on the floor, you can set the reflectivity of every object from -absorbs light (ie a black hole) to better than the best mirror possible. The carpet reflects like a polished floor not like a fabric which means the setting is too high. If you look at the pics of him dead on the floor you’ll see it’s a carpet but again there is no depth to the carpet and it looks odd. In this pic (someone added a logo) I have seen the original somewhere but can’t find it right now. The two chairs are pushed together. On the left side they seem to be fused together but not on the right side. That looks like what you get when you have too object in a render that are occupying the same space. Then why did the LE spokesman say they were trying to find out who released the crime scene photos if they are not really the crime scene photos? Are you saying these two photos are “rendered”? The FBI claims they are the crime scene photos. They look wrong and I think they are computer renders not actual photos. Now if I am correct and they are not real photos then the fact the FBI is claiming they are means they know they are fake and more than likely had a hand in making them. 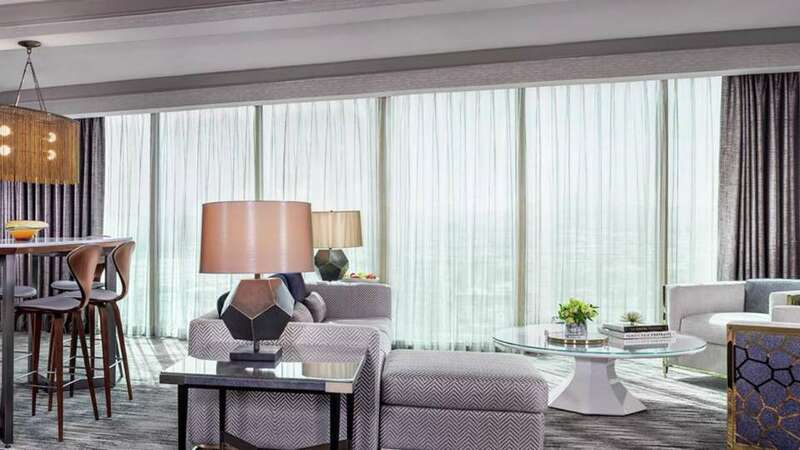 Here is a promo photos of the same suite from the hotel website. Notice the floor has depth and in the photo below the curved chair he used as a rest is different, it’s reflective on the metallic threads not the whole surface of the chair. I could be wrong, it’s just my theory. Look at the 2nd of the photos you posted, his body and the gun under it seem to merge unnaturally with the floor, that’s because unless you have a really good render engine objects will not deform when they intersect but rather try and occupy the same space. All I know is if he killed himself and ended up that way, physics and the normal body’s reactions to serious head trauma took the day off. Another point: All the AR pattern rifles are CLEAN. No muzzle carbon. No powder fouling. AR rifles. After + 1000 rounds. AND: “1000” rounds herd on audio. for 600 hits. At 300 to 500 yards. With a 5.56. From “not a gun guy”. The total time of actual shooting (recorded audio) is LESS than 8 min. Its no wonder the NSA is telling you tube to scrub the videos. AND: Just this morning, REPUBLICANS introduced a bill making anything firing faster than a muzzleloader an NFA level felony that cannot be “manufactured ,transferred, or possessed by any person and must be turned in to the government for destruction” That boys and girls is a declaration of war on the American gun owner. It doesn’t say anything about “bumpfire” “TACTRIGGER” or any brand or design. IT SAYS “Anything capable of a high rate of fire” Meaning ALL repeating and semi-auto firearms. It is a UN Universal gun confiscation law. 1) Audio evidence of at least 2 shooters. 2) Numerous ex-military guys saying the rate of fire is like a belt fed and too high for a bump stock. 3) A body that looks staged and didn’t fall naturally. 4) Crime photos that are computer generated and not real photos. 5) The bradey campaign had a law suit filed in less than 48 hrs against bump stock makers. 6) A security guard who isn’t listed on the employee records for the hotel or who’s records where scrubbed. The rate of fire wasn’t too high for a belt fed. That could be anywhere from 550 to 1200 rnds a min. depending on the weapon used. It was because some of the strings were too long to be any type of box or drum mag for the rate of fire, and the consistent cyclic rate. A bump fire stock equipped rifle is not generally consistent. It fluctuates due to the pressure exerted or not exerted by the firer’s grip of the forearm. This guy was supposedly a “Non Gun Guy” right? A “Non Gun Guy” wouldn’t be able to provide any consistency with his accuracy, let alone his use of the weapon with an add on device that the weapon was not originally designed to use. Bump fire stock equipped weapons are notorious for jamming when people who know what they are doing are using them, so add that into the mix. I meant the rate was in the range of a full auto but above that to be expected with a bump stock.